The Jacksonville Transportation Authority (JTA) was awarded a $16.9 million Capital Investment Grant from the U.S. Department of Transportation’s Federal Transit Administration (FTA). The funds will be used for the First Coast Flyer Bus Rapid Transit East Corridor or Red Line which is the fourth segment of a five-phased First Coast Flyer system planned for the Jacksonville area. Please for the love of all that is holy, STOP calling this BRT (Bus Rapid Transit). It is not now or ever will be BRT. I ride the BLue Line daily and it saves 5 mins off the old non "BRT" route. During holidays at the Aveneues it can as long as 30 mins to move from US-1 to into the Mall parking lot. Also "off-board fare collection" was a big selling point for the system. Yet, try and prepay anywhere along any of the system lines. Hell, outside of Downtowm and regency square there is no way to load or purcahse passes at any bus stop. JTA is the poster child for Jacksonville. "We're going to something, but we're going to do it half-assed, and when it doesn't work, we're going to say; "see, told ya so."" Can someone refresh my memory. 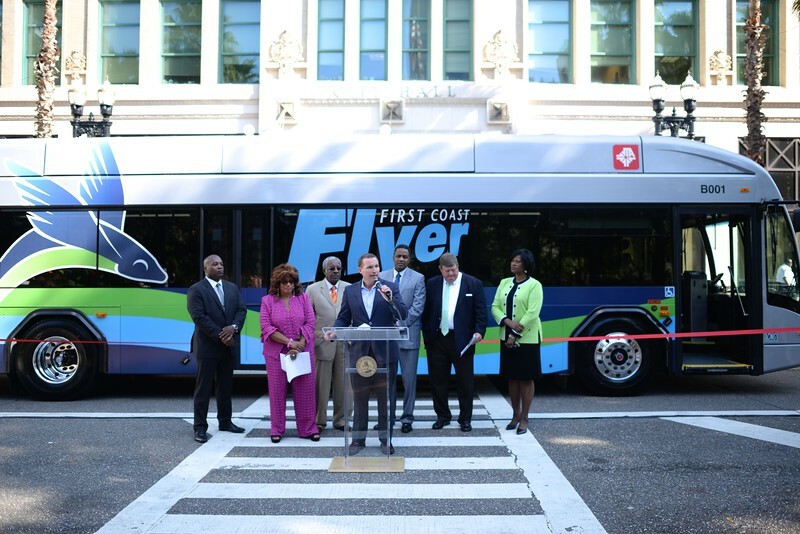 What changed between the initial BRT plans and the First Coast Flyer? When BRT vs. Commuter Rail was the hot topic on MetroJacksonville a decade ago, the JTA was planning for a $600 to $800 million, ~30 mile true-ish BRT system with dedicated lanes. The system wasn't scheduled to provide its first ride until the 2020s, and it didn't extend to Orange Park, the Avenues, or the Beaches. How did we end up springboarding to a ~$130 million, 57-mile BRT-light system in mixed traffic, extending to the Orange Park Mall, Avenues, and Beaches? I know people hate on it, but when you look at the grant money and consider how much Jacksonville has actually paid for the First Coast Flyer system, it's kind of a steal. I don't think it necessarily precludes commuter rail from becoming a thing in the future, but it at least gets something up and running at a reasonable price (the entire system is cheaper than two miles of the Skyway cost to construct) in the short-term. The discussion and debate started by Metro Jacksonville had a lot to do with this. We eloquently presented an opposing perspective showing how the original plan was nothing more than an expensive way to build HOV lanes on expressways to areas of town that had stopped growing years ago. We also demonstrated that it would cost twice as much than suggested, based on the cost per mile of comparable recently built BRT projects across the US. In addition to promoting the benefits of a hybrid DMU style commuter rail system (more of a mix between LRT and traditional commuter rail), we suggested affordable ways to improve local bus service on a budget. Much of this ended up in what's being built now for a fraction of the original plan's costs. We won't get public credit for it but it's possible we saved a billion in tax money on BRT by getting vocal. While what we have today is not true BRT (I've always and still believe transit agencies tend to overhype these things), it is better than what we orginally had and a bus system with reliable high frequency routes is needed to support and feed riders into any rapid transit or circulator system. It's not a steal but it is more cost efficient than the original concept. Back in those days, we also had $100 million in local BJP money reserved for rapid transit. If used probably it could have been leveraged for additional state and federal money for a legacy project. Unfortunately Jax blew that opportunity. I don't believe that these have anything to do with each other, in terms of implementation. This is one of my big gripes about Jacksonville. We can have and accomplish much more than we do if we don't pit complementing modes against each other. ^Thanks for the refresher, Ennis! What do you consider to be the logical next-step for JTA once this is finished next year? First Coast Flyer or U2C? FCF is pretty much done. The last line to Orange Park will be implemented following the route to the beach. U2C is a different animal. It really needs less PR and talk about emerging technologies and more emphasis on what best fits Jax, how and when funding can happen and how this data ultimately determines the technologies best suited to accommodate the local environment. That bridge rendering alone, hurts the argument of the concept being cheaper than extending an elevated monorail system. While everyone would agree that being able to drop down to grade is preferrable, a new river crossing that size is easily over $100 million and there's no real technical or traffic data supporting that it's even needed. You can't claim cheaper costs and then include something that alone could cost more or just as much as ever transit technology out there. Having valid data would weed out or validate things like this and set the path to implementation in progress. Then there's other areas of potential interest like TOD, Brightline connectivity, CSX wanting to get rid of thousands of miles of lines, identifying alternative funding sources, etc. There are a lot of things that need to be vetted simultaneously. JTA is very confident that the final piece of the BRT, the Southwest Corridor, will be fully funded this year. This is the final piece of this particular BRT project.. but not the final piece of BRT in Jacksonville.